Project DU Reader is a new RSS newsreader, with some innovative ideas and a cross-platform promise: Win, Mac and Linux. While Project DU Reader is presently available only for PC/Windows, the Mac version will be out in a matter of days (while the Linux one is still under development). It is also comforting to see a company getting the gist of how strategically important is to provide a product that fully works across platforms. Nonetheless every geek and marketing VP keeps repeating that there is not enough of a market out there, I remain of the opinion that having a product that is available on all three major operating systems gives a tremendous boost in popularity, credibility and end-user confidence in it. When people know that they can interoperate using that tool with just about anyone out there, their willingness to try it and share it with their close contacts increases manifold. So far, there have been a few other RSS tools that worked across operating systems, and their final performance, interface and look and feel left much to be desired. It is also true that all web-based RSS news aggregators/readers like My Yahoo, Bloglines, Kinja, Gush, and many other ones are ALL accessible from any type of operating system and computer. c) some ideas for applying innovative new monetization approaches to this. Project DU Reader is definitely a tool that is breaking new ground in the right direction. I like the foundations on which Project DU is built, and would much like to help them stretch it out further. c) which could also provide profitable business to all parties involved (in intelligent, non-intrusive, ethical and creative ways). I didn't succeed. So let me try again. Project DU Reader truly inspired me on the same wavelength that had originally sparked my interest and quest for bulding a custom RSS reader. It also offered me an opportunity to take up again this very relevant topic, which missing for me, a strong development and engineering lab, I have had to leave to rest for a while. So here I am, recounting first what I saw inside Project DU Reader that inspired me and then suggesting how this type of tool can be taken to the next level to become an infinitely useful, disruptive and possibly very profitable solution for content publishers of all kinds. Here are the good things I saw when I downloaded Project DU Reader and I tried it out on my Windows PC. Create new categories for news channels with extreme ease. Add new RSS newsfeeds by simply clicking the "Add Channel" button and filling in a simple dialog box. Customize the look and feel. Three different color themes are available as well some pre-loaded icons for the favourite links to place on the top toolbar. Send an email to a friend/colleague and personalize the message there contained, while inviting the recipient to download the Project DU Reader (at the standard URL). The formatting of the content inside the newsreader is left to dubious aesthetics and not to an effective implementation of solid information design principles that would allow content to be easily scannable and immediately legible. Lots of work needed in this direction. Overall interface: too noisy, clunky, and colorful. Too many ads on top, too much of this coolish 3D shaded buttons and other "chrome" cluttering up the interface. The interface in a tool like this needs to be quiet. Yes, the buttons are cool, but we did not download the tool to contemplate some cooly designed 3D looking funky buttons. We wanted to have a tool that allowed us to get at the news we care about the most before anyone else. We are here for the content. So turn off the visual noise and buy yourself some Edward Tufte's books, access to Kinja and Gush for appetizers and a copy of Groove to get really inspired. Something slick, minimalist and with the minimum amount of color. Just enough to highlight or note what is of importance. We need the interface to be a complement to our experience. Not to try to be the experience itself. At least in this case. Happily you can easily add any new URL for new feeds and place it inside any one of the major categories you have available. As easily, existing feeds can be deleted, renamed or modified in any way you like. "It's filled with headlines from some of the best blogs you've never heard of. In fact, we've spent hundreds, maybe thousands of hours scouring the web, trying to find the most intriguing sites the world has to offer. To be fair, we pay the favored blogs a bit each month for the right to use their stuff. But we don't edit what they say, that would be a very un-fun read." That is pretty interesting indeed and relevant to the many hot discussion going on in the blogosphere about this very issue: should bloggers be paid? Total customization of the branding and look and feel by the end user. Allow the end user to give a name to the tool, to place/create her own logo, main title and even craft the specific terms for the different functionalities and commands. Provide few predesigned templates/skins to facilitate the task of those that are less technically skilled. Allow anyone to submit skins (with embedded sponsor links) that can be adopted by others. This is absolutely critical in making people want to go out of their way to put some good work into this tool. Ownership of their work is all for them. (Since downloads could be kept centralized at the source, one could still track who are the top distributors, reward them while making this information readily available to anyone). Ability for the content publisher and "customizer" of the DU Reader to add feeds by performing searches and not just by adding individual authors feeds. Ability to add individual feeds, search query feeds and also for adding multiple individual feeds or search ones into one master new syndication feed. (With some basic options for eliminating duplicates or excluding selected keywords). Make it truly cross-platform. Win, Mac and Linux. You may not see a "market" for those two other platforms, but believe me, this is like what used to be an investment in "brand image". You just have to do it. Plus, in the Mac and Linux communities you have some of the finest and most creative minds available out there. What do you want to leave them out in the cold? They themselves could be your very best distributors "toward" the Windows users. Think again. Allow full sharing and re-distribution of any newly created DU personalized reader. End users can redistribute it too, but the customized version does not allow further editing outside of allowing the addition of selected personal feeds. This specific list of basic additional features would make your average RSS newsreader a disruptive instrument for marketing, news distribution, independent publishing, marketing of other products and sales, vehicle for contextual advertising and sponsorship, and possibly a lot more. RSS adoption would get an injection of confidence as this would provide a self-explanatory vehicle for offering RSS to the novices. d) monetize this mechanism by using several alternative and complementary approaches. Each user selects the one(s) most appropriate to her philosophy, products and goals. In essence, make the RSS newsreader become a "platform" for filtering, aggregating, and publishing custom content-specific news that empowers the small and large publishers to fuel end-user adoption in an effective and self-sustainable way. By adopting the above-listed suggestions, content publisher are motivated to create custom and freely distributable DU newsreaders that are targeted to very specific custom audiences. Why having the end users do all of the effort of getting the RSS feed to go into a reader with all of the little nuances and difficulties that may involve? The more content publishers can customize and personalize to their liking this tool, the more opportunities they themselves will create. Who wants to ride this RSS Wave needs to give the end users lots of opportunity for becoming authors, and effective marketers distributors. Content publishers enabled with these tools will do the content authoring, filtering, selection needed to create a high-quality information channels. Given the tools (or the "service") they will personalize and make the tool look sharp and effective to use. Essentially they will find the solutions for you. Because they want to be doing an effective job of it while becoming financially independent with this. they really only have to grab the ball and run with it. They will market it and spread these topic-related digital content aggregators in a myriad different incarnations all by themselves. If independent content authors can be given the opportunity to have an extra, reliable, complementary channel for distributing their content to their readers, while reducing their surfing time and bringing to them the cream of what they want to be updated about, they will take that opportunity and use it to their best advantage by creating new content, distributing it and finding the best way to monetize it without selling their credibility and filtering authority. It is therefore the task of those who are developing these tools to anticipate, explore and analyze emerging new monetization opportunities, while strongly avoiding traditional approaches (such as inserting ad banners inside the reader). It is in the hands of these geeks, developers and hopefully of some smart and forward looking investors to understand how huge this opportunity is, and how perfect the timing happens to be. First of all make sure that you "embed" alternative and non-exclusive monetization options for the content publishers to "activate" within these tools. Allow diversification and multiple parallel approaches to monetization instead of only one. Integrate facility to sell sponsorship/space/link and integrated payment system. Share a percentage of the sponsorship income generated by the sponsors. Provide ability to switch on complementary contextual adstrips (a-la Google AdSense) to anyone master feed that is to be redistributed. Go a step beyond Google AdSense approach and allow individual content publishers to select from an inventory of relevant, qualified advertisers, the ones most fitting for each one of her news channels. Provide ability to integrate Amazon promotion for relevant books and DVDs with an Associate Amazon ID so that a commission can be earned for each product sold. Provide ability to sell sponsorship on any masterfeed (a newly aggregated feed composed of multiple search feeds and filtering across specific authors). Allow integration of third-party services / promotions that can create further income when those services get bought or for clickthroughs in case of ads. One good example of a possibly effective good complementary service is a Flash-based videoconferencing service, which can be easily integrated in the newsreader. Such a service can be easily tested and tried out by the end user and if valuable to him, it should be made extremely easy for the user to activate/pay such service without needing to download, install anything extra. Allow the content publisher to integrate promotion/marketing space for affiliate products out of an inventory that can be directly made accessible to her via the tool itself. That is: the content publisher can select ALSO products and services that she sees fitting with her content and that she promotes as an affiliate reseller. Every product sold gives the content publisher a commission. Make it extremely easy for the content publisher to add links to her own specific products or other related services she may have available online as to make a perfect bundle of valuable fresh content with the traditional product line or set of services the publisher is interested in further promoting. Add optional integrated tracking (allow end-user opt-in in exchange of free use) and monitoring of all clicks and story viewed. Offer free access to basic data and paid access to advanced information with filtering capabilities. Integrate optional ability for carrying out audio or even video interviews, that could be recorded, and podcasted back through this distribution tool. Sell Premium versions of the tool containing some or all of the listed above features for customization, branding, feed newsmastering, podcasting as additional fee-based options at a one-time price (perpetual license) or for a monthly cost. On many of the above options, the developer of this tool can bank on keeping a small percentage of each and any of the transactions that can take place through those monetization options. On the other hand, the developer should be smart enough to offer also a set of fully licensed versions that allow the independent content publisher to not only do as much as otherwise possible but also to keep in full the income streams from all of the monetization venues integrated in exchange for a bigger one-time payment at the beginning. Well, these are just initial ideas. I am sure they could be much refined and improved. 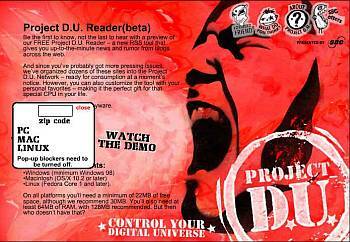 Download Project DU Reader now. Free. N.B. : Project DU is owned by SBC Internet Services, which is itself part of the mega ($41bn) US telecom operator SBC, a Fortune 50 company. and can't thank you enough.